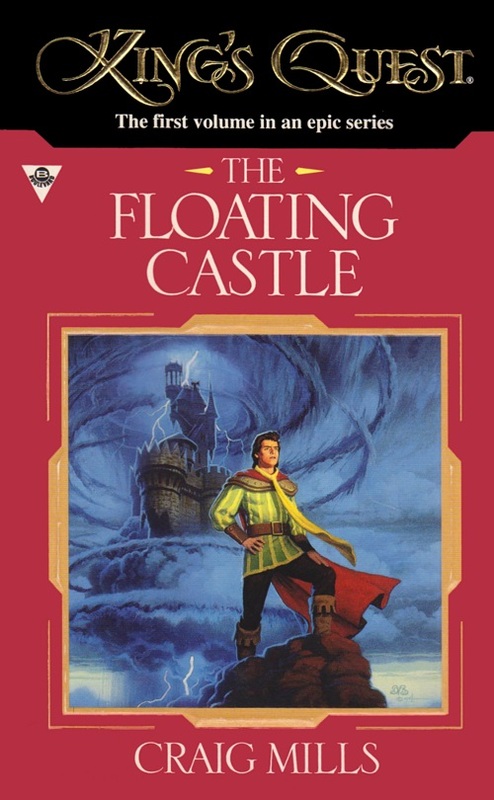 Based on Roberta's Williams King's Quest series, King's Quest: The Floating Castle is the first volume out of three King's Quest novels. Sierra had little to do with the books other than licensing another company the permission to write them. According to the Fall 1995 issue of Interaction Magazine, King's Quest: The Floating Castle is a way to experience the magic of King's Quest without a computer. Unlike the second and third novel, this novel was written by Craig Mills. Roberta Williams owned a copy, which she and Ken donated to the Strong museum, along with their collection of game development notes, maps and artwork. The story takes place after Alexander's return to Daventry, some point between KQ4 and KQ5. As he hurries home to avoid an upcoming storm, he notices what looks like a dark flying castle in the sky above him. Sure enough, after a particularly vicious storm, the dark castle has planted itself right in Daventry's countryside and sends warriors and monsters to terrorize the bewildered land. The villain in this story, the powerful wizard Telgrin who stole the castle, comes to the castle and demands power over Daventry and its people. When Graham refuses, the wizard steals his soul. Alexander immediately sets out with Cyril, an apprentice wizard to retrieve it.